Arlo has just turned 4 months. That old cliche of where does time go is definitely ringing true- where has all the time gone!!! Our tiny little newborn has grown into a gorgeous, smiling, happy baby. He is really starting to become a little person with a little personality. Arlo is a very relaxed, chilled out baby. He doesn’t really cry much. When he is hungry he just sort of makes an angry chatty noise and shuffles around. He is starting to give us real little giggles now which is so cute! Raspberries on his tummy or a little game of peekaboo get these going. He also gives the biggest smiles. Smile at Arlo and he will definitely give you a smile back! Especially if your name is Woody- his big brother is his favourite!!! 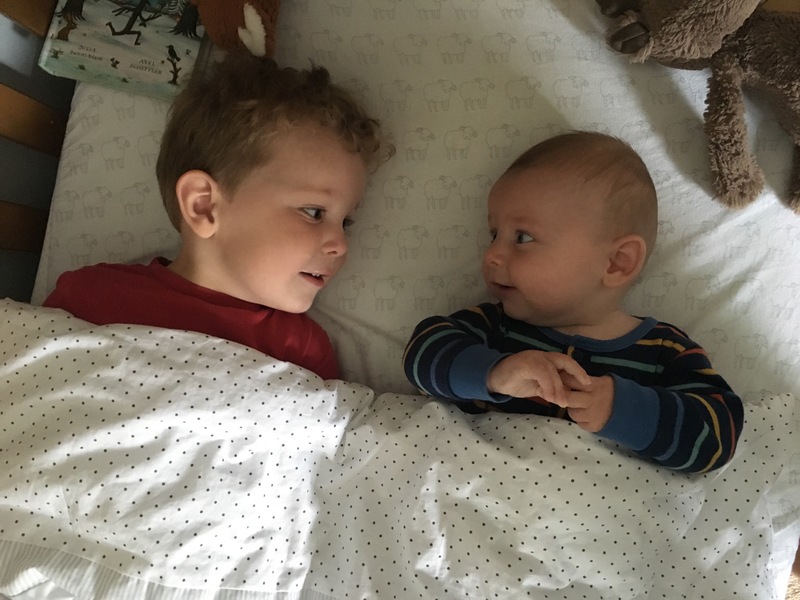 Arlo always has a story to tell- his baby babble sounds very interesting and he can give a great conversation! I think we have another chatterbox on our hands- our house is never going to be quiet!!!! When people ask me if he is a good sleeper I smile and say ‘yes, he only wakes 2 or 3 times a night’. Mostly people look horrified or sympathetic, probably wondering why I think this is good!!! I don’t think this is good, I just don’t want to moan about it too much. I can’t really complain- he is usually awake in an evening, goes down at about 9-10pm and will wake at 1am-ish and 3am-ish. Sometimes more, sometimes less. Usually these awake period last 10-15mins- he feeds and goes straight back to sleep. So I feel we are lucky that they are so short and not long periods of feeding, burping and rocking to sleep, but I do hope he feels like dropping the night waking soon!! At the age of 4 months he has outgrown the Moses basket. Woody was in it until he was 6 months (although he was quite squished in it towards the end! ), so it’s really not lasted as long for Arlo! Because of the night waking I still need him close to me, so he is sleeping in his travel cot! 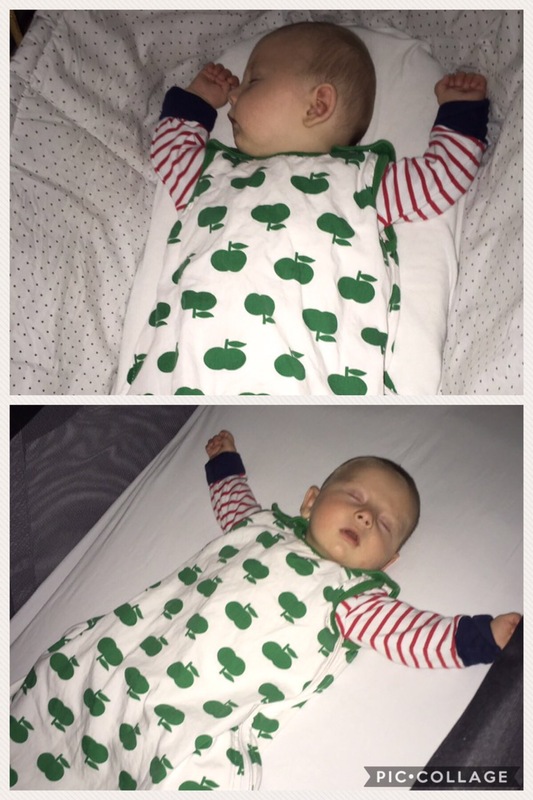 He’s sleeping like a star with his arms out now so think he is appreciating the space!!!! Breastfeeding continues to go really well. I am still enjoying to feed him and find it so easy. We have however started to try and give him a bottle in the last week and that isn’t going so well. I have been expressing some milk to try and get him onto the bottle but he doesn’t seem to want to latch into the bottle, just swirls the teat around his mouth not taking any milk! We started this so I could have an evening off and go to an Adele concert I booked tickets too ages ago, but it now doesn’t look like I’m going to be going. I’m not prepared to just leave him with a ‘he will drink it if he is really hungry’ attitude. We will keep trying though- I want him to drink from a bottle eventually so he is going to have to learn otherwise I’m never going to be able to leave him!! Arlo’s two front bottom teeth don’t look to be too far away. They are visible when looking at the front of his gums but haven’t cut through yet. He is constantly munching on his hands and fingers as it must be bothering him. 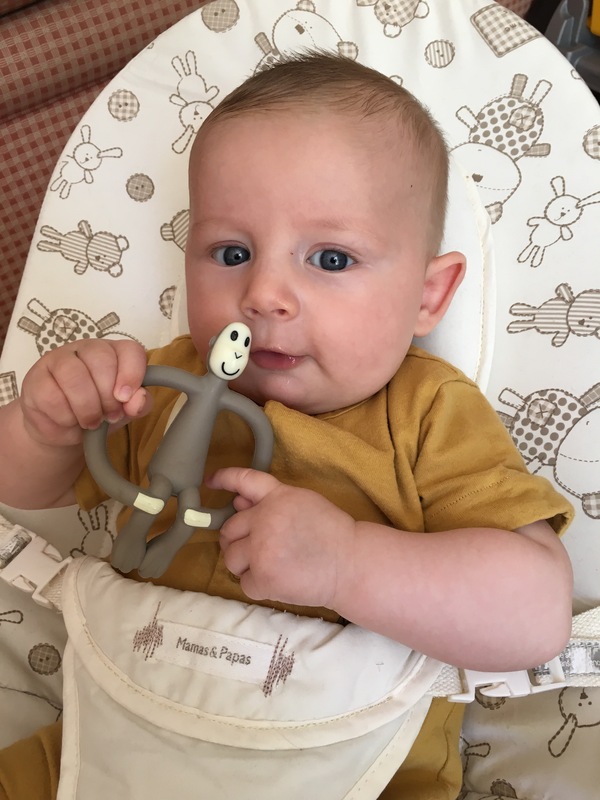 He also has a few toys which make their way into his mouth as soon as they are in his hands- his teething monkey being a favourite for this!!! Things feel like they are becoming more exciting now as Arlo is interacting more and growing as such a happy little baby boy. Him and Woody appear to be developing a really loving and happy relationship which makes me excited for the future of our little family of 4! !